Cayenne peppers are much more than key spices in most kitchens. They also boast medicinal benefits, such as reducing arthritis pain and asthma. Cayenne is one of the oldest crops to have been domesticated by humans and it was cultivated in subtropical areas the Americas as far as 7,000 years ago. Cayenne has jumped to fame as one of the most popular varieties of pepper thanks to its particular smoky taste. Keep reading to learn more about cayenne pepper health benefits and the many ways to incorporate it into your diet. Lowering pain and inflammation. It is particularly effective in alleviating cluster headaches, as well as easing arthritis pain, post-operative neuralgia, and diabetic neuropathy. Clearing the airways. Cayenne has been long used as an effective oral treatment for cough, nasal congestion, asthma, and other allergic airway inflammations. Healing gastric ulcers. Cayenne active compounds have a stimulant action on the mucus of the stomach, thus helping in the prevention and treatment of gastric ulcers, as well as promoting digestion. Reducing cholesterol. It helps to prevent the formation of cholesterol gallstones. Growing hair. Cayenne has been attributed to promote air growth. Losing weight. The consumption of cayenne peppers has been linked to weight loss, since they seem to curb the appetite and raise body temperature, thus aiding to burn calories. 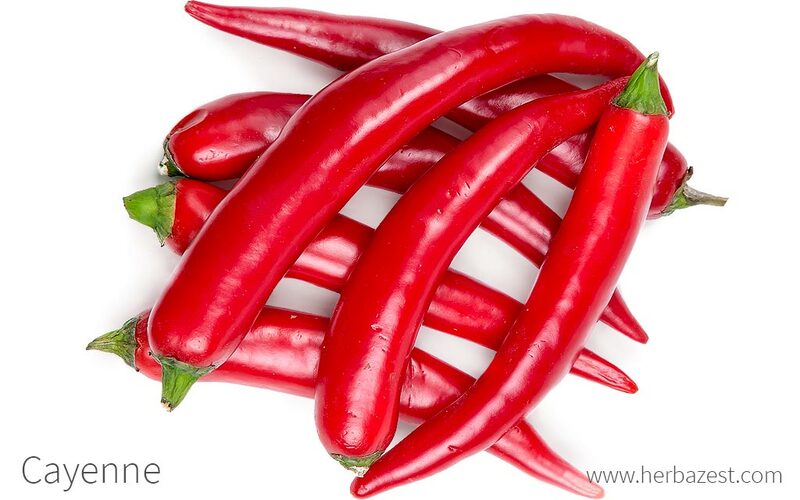 Large amounts of capsaicin provide cayenne pepper with both spiciness and health benefits. Cayenne's nutritional value of is equally impressive, as it contains high levels of vitamin A (retinol) and significant amounts of vitamins B2 (riboflavin), B6 (pyridoxine), C (ascorbic acid), and E, as well as essential minerals, such as potassium and magnesium. Capsaicin acts as an analgesic by mainly irritating, and then numbing, nerve endings upon topical application. Recent research suggests that capsaicin consumption may play a role in diminishing arthritic symptoms, relieving diabetic neuropathy, and treating cluster headaches, as well as in allowing for weight loss by increasing thermogenesis and caloric consumption. Traditionally, cayenne pepper consumption has also been associated to an increased blood flow throughout the body, helping to clear airways and boosting immunity. This is by virtue of its antioxidant activity, which controls levels of cytokines, proteins of low molecular weight that can stimulate or inhibit cell recruitment to the airways. This explains why cayenne pepper is such an effective oral treatment for allergic airway inflammation. Other herbs with analgesic properties are chili peppers and cloves, while turmeric and nettle share anti-inflammatory benefits. Skin, eyes, nose, and throat irritation, burning, and itching when applied externally. Stomach upset, sweating, flushing, and runny nose when consumed in large quantities. The use of cayenne pepper's main compound, capsaicin, is not generally recognized as safe and effective by the U.S. Food and Drug Administration for fever blister and cold sore treatment. People with irritable bowel syndrome (IBS) or other gastrointestinal disorders should consume cayenne pepper in moderation or avoid it altogether. Although it is safe to consume cayenne in food during pregnancy, it shouldn't be taken as a supplement by pregnant or nursing women, since it does pass into breast milk. While it has many culinary uses, the most effective way of obtaining cayenne pepper's numerous health benefits is in medicinal forms of consumption, where its properties are more concentrated. The flavor added by cayenne pepper is widely popular and, although highly spicy, is prized by many people. A great way to reap cayenne health benefits is consuming it in food, where it can be added to many dishes. Raw. In its fresh form, cayenne peppers offer all their health benefits plus their vitamin content. Crushed or chopped, cayenne peppers can be added to salads, dressings, and marinates. Dried. With or without their seeds, cayenne peppers can be used for flavor in their dried form. They will retain most of their health benefits and have a longer shelf life when dried; however, their spiciness will be reduced with time. Flakes. Cayenne pepper flakes include cayenne seeds and can be spread over baked goods, such as bread and pizza, as well as over any food, in order to bring flavor and hotness. Ground. This way preserves the spiciness and anti-inflammatory properties of cayenne pepper. It has a long shelf life in proper conditions; however, its vitamin content is reduced. Oil. Infused cayenne pepper oil can also be used to flavor a variety of dishes and reap its many health benefits. Hot sauces. Capsaicin is widely used as an ingredient for homemade and commercial hot sauces. This is a great way to enjoy the spiciness of cayenne pepper and reap all its health benefits. All cayenne remedies and supplements contain capsicum, and are derived from the leaves and fruit of the cayenne plant. They can be taken by mouth or be applied externally, depending on the intended use. Cream. Cayenne cream's water content allows for a quick absorption and it is often used for the topical treatment of arthritis and joint pain. For external use only. Never applied it on open wounds or broken skin. Essential oil. Cayenne essential oil it is used topically in massages to increase blood flow, which nor only reduces local pain but also has a thermogenic action, helping to burn calories. It should never be ingested or applied over open wounds or broken skin. Extract. Cayenne extract can be used both orally and topically. Few drops diluted in a liquid or mixed with food will give a boost to the immune and circulatory systems. Tincture. Cayenne tincture may be diluted in hot water or food to relieve headaches, promote digestion, and increase blood flow throughout the body. Salve or ointment. Cayenne salve, also known as cayenne ointment. It is used for the topical treatment of sore muscles, joints, and contusions. For external use only. Never applied it over open wounds or broken skin. Oil. Cayenne oil is very easy to make at home and it is mostly used for topical treatment of arthritis and joint pain, as well as for hair treatment. However, its digestive and anti-inflammatory effects can also be reaped by cooking with it. Capsules. Cayenne capsules and coated tablets are very popular as a weight loss aid, mainly due to the thermogenic effects of capsaicin. They provide a consistent dosage without cayenne pepper's spicy taste. As using cayenne peppers for cooking is a popular practice all over the world, this spice is widely available in most grocery stores and local markets in all its eatable forms: raw, dried, as flakes, ground, or as a sauce. Cayenne, on the other hand, is a hardy and low maintenance plant that can be easily grown in any garden. Cayenne peppers oil, extract, tablets, and capsules are among the most popular products for weight loss and hair growth and they can be easily found in herbalist stores, specialized health stores, or through online retailers. It's worth bearing in mind that each brand of cayenne pepper supplements can come with different concentrations. Although large-scale plantations of cayenne pepper are limited to tropical or subtropical regions, this is a very drought resistant and hardy plant, and it can be grown at home. Some basic care will ensure cayenne's successful cultivation. Cayenne plant is best grown in sandy soils with low retentive capacity, and it thrives under sprinkle or spray irrigation. Cayenne peppers require both good irrigation and sun exposure in order to grow and for the fruit to mature properly. The higher the exposure to heat and direct sunlight, the hotter and higher-quality will the harvested fruit be. Cayenne plants can be planted as close as one foot (30 cm) apart, though a spacing of three feet (90 cm) is preferable. They will demand some pruning, and can grow up to four feet (120 cm) in height. Cayenne peppers require about 100 days in order to mature. Cayenne peppers can be grown in the winter as long as they are protected from frost. The plant's roots are very susceptible to a fungus known as Phytophthora capsici. Detailed information about growing cayenne can be found in the herb garden section. Cayenne is a variety of the species Capsicum anuum. Native to the Americas, it is an herbaceous annual that reaches a height of three feet (1 m) and has pubescent lanceolate leaves, white flowers, and fruit that vary in length, color, and pungency depending on the cultivar. Among many related peppers, cayenne peppers are easily recognizable for the elongated, bright red form of its fruit. Biologically, these species are closely related to jalapeño peppers, bell peppers, and paprika. Capsicum anuum (grown in Europe and North America) and Capsicum frutescens (grown only in tropical and subtropical areas of the Americas) are distinct species of Capsicum, a genus that encompasses over 300 types of peppers of different flavors, shapes, and colors, including bell pepper and chili pepper. All are members of the Solanaceae family, also known as the nightshade family, which contains approximately 2,700 species of flowering plants. However, C. frutescens is much more pungent than C. annuum. Although there are currently five different species of Capsicum cultivated by humans, due to the worldwide importance of the crop there countless varieties of cayenne peppers, depending on the precise geographical region where they grow, with great variations in color, taste, and hotness. Some of the most popular cultivars of cayenne peppers are 'Buist's Yellow', 'Carolina', 'Golden', 'Iberian', 'Indonesian', 'Joes Long', 'Large Red Thick', 'Long Slim', 'Long Thick Red', 'Passion', 'Ring of Fire', and 'Sweet'. Cayenne peppers have been cultivated and used as an important crop for more than seven millennia in South, Central, and North America, cultivated first for decoration and then for culinary necessities. In the 15th and 16th centuries, cayenne peppers were introduced to Europe after Christopher Columbus encountered them on his travels, and from there, they spread to the rest of the world, eventually becoming a staple food in many cultures. The main economic value of cayenne peppers derives from their widespread use in the culinary industry, especially in the manufacture of dried spice blends. India is currently the biggest producer, consumer, and exporter of cayenne peppers, growing over 850,000 tons annually. However, they are also produced in Israel, Mexico, the U.S., and Morocco, among other countries. Cayenne pepper is the most popular type of pepper sold throughout the world. Cayenne peppers have also found uses different to the medicinal and culinary ones. Its main compound, capsaicin, is sprayed over food crops, bird food, and surfaces as a non-toxic pest deterrent, since many insects and most mammals are repelled by its pungent smell. Since cayenne peppers' capsaicin is an intense skin and eye irritant, it is used in commercial pepper sprays for self-defense purposes. Cayenne pepper extracts are also widely used for color and flavor in commercial foods and beverages. Cayenne is used as an ingredient in many personal care products for hair treatment, such as lotions and shampoos.